I like living in New York because there are so many places for climbing. The best part of climbing is that people see that you’re good at it, and so they like you and want to be friends with you. I’ve been climbing for three years; for me, it is kind of a long time. But I always like it, and I’m always good at it. My favorite feeling is when it’s a new place, and I feel good when I get to the top. I practice every day after school, until it gets dark. When it’s not too cold or hot, I practice at the rocks in Central Park. It’s great—like a big playground. When I started, I just had sneakers, but now I’m sponsored by Evolv, so they gave me my favorite shoes, which are called Optimus Prime, who is the best and nicest Transformer. 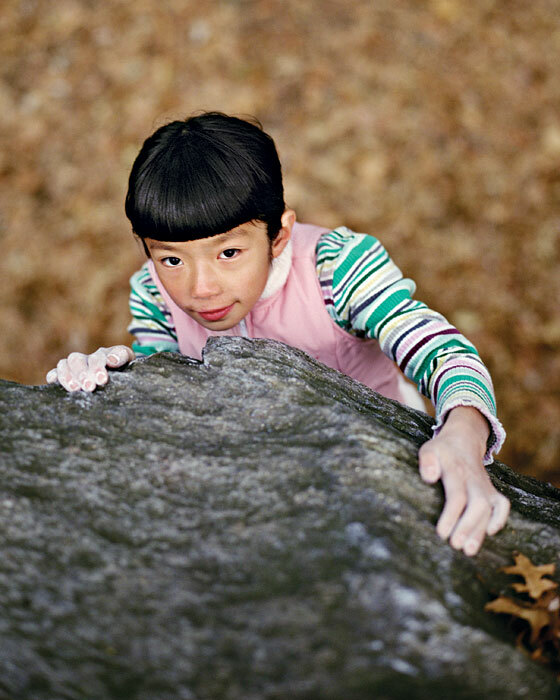 On November 20, Ashima will compete at the American Bouldering Series Local competition in New Jersey. She hopes to make it to the ABS National Championship in February.